Quick & Easy Meatball Recipe, That’s Healthy Too! Daphne and I whipped up some of my basic meatballs for dinner the other night on Facebook Live. This is one of those dishes I can make with my eyes closed! It’s easy, healthy and tasty – what more could you want?!? I served it over rice with a side salad, but you could also put these in a traditional tomato sauce over pasta. For the complete recipe grab a copy of my cookbook on Amazon. In The Family Plate cookbook you’ll also find my tomato sauce recipe and a variation – Middle Eastern Meatballs! Meatballs are super kid-friendly and very quick to put together for a weeknight meal, plus they make great leftovers! How do you make your meatballs? In the video I also discuss ways to make your meatballs gluten and dairy-free without losing flavor! Enjoy! I can’t remember how it started, but 2 years ago I started a love affair with restaurant ramen noodles. There was a local ramen joint that I loved that had these big bowls of delicious broth, pork, and ramen noodles. It just seemed like the perfect winter food to me! 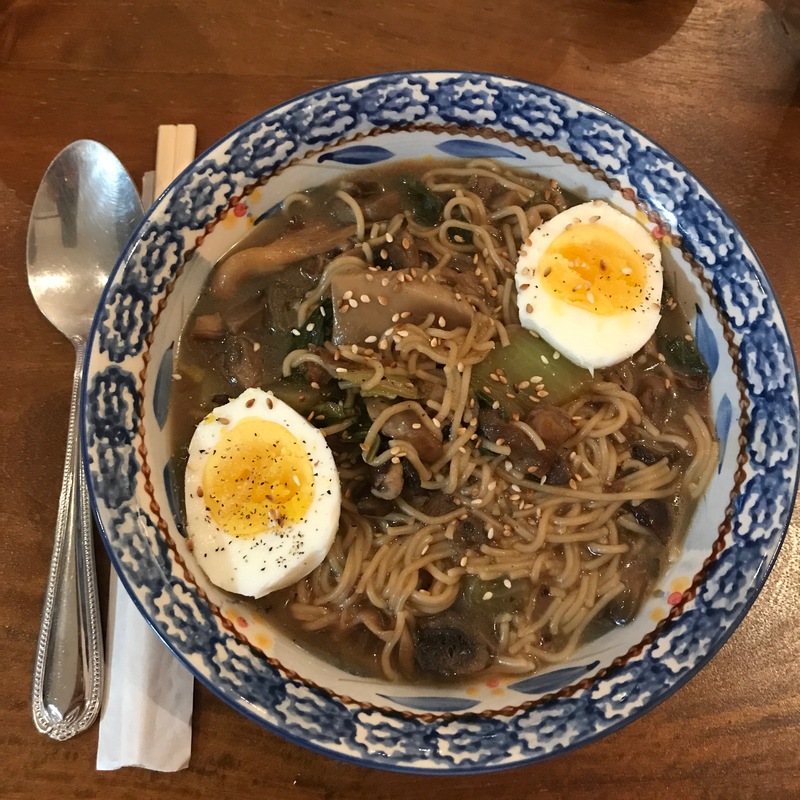 About a year ago, I discovered Brown Rice Ramen Noodles at the store, and I figured I could make this dish at home! There’s many different ways to make it – chicken, pork or vegetarain. In this version, I used some proscuitto (I know, wrong cuisine) to add flavor because I had it on hand. Feel free to omit it (to make it vegan), or add the protein of your choice. Since my Facebook live video last week about making tomorrow’s breakfast got such a huge audience, I decided to a Facebook Live video with all the instructions for the ramen recipe. It’s pretty rough around the edges, and you’ll get to see me in my actual kitchen making dinner and dealing with kids and my husband who interrupts, gets in the way, and tries to eat ketchup straight up! Ewe! It’s real life! Instructions: In a large pot, over medium heat, add the olive oil and sesame oil and minced garlic. Let the garlic become fragrant. Chop the proscuitto and add it to the garlic and oil, lets the proscuitto become cripsy and brown – about 2 minutes. Rinse and chop the boy chow and mushrooms. Once the proscuitto is crispy, add the mushrooms and then the boy choy on top. Add soy sauce. Cook down for 5-7 minutes until the mushrooms have turned brown and softened. Add the water, depending on the size of your pot you can use 6-8 cups. Add the Osem, let it come to a boil. Peel your hard boiled eggs. Once the broth has come to a boil, add the ramen noodle patties and let simmer uncovered. After 3 minutes, use a fork to untangle the ramen noodles. Simmer another 1-2 minutes until noodles are done. To plate, place one hard boiled egg on each serving cut in half lengthwise, scallions and sesame seeds. Finish it off with a splash of sesame oil. What could be better than a hot bowl of soup on a chilly day? I started making vegetable soups as an “appetizer” before our family dinner each night, because they are so filling and help you eat less at dinner. Plus, in the cold months (of which we have many in New York) soup is so comforting. Having a vegetable soup also helps you get more vegetables into your diet, and is a great way to introduce more vegetables into the diets of the picky-eater. It’s loaded with flavor and also very healthy – a perfect combination! This soup smells wonderful cooking on the stove top and is a “one-pot wonder” so clean up is a breeze. To prep the vegetables (except the celery and onion) I suggest using a box grater to obtain a fine texture. The celery and onionI just finely chop because I’ve noticed it doesn’t grate well. You’re hard work grating will be rewarded, since you can easily freeze half of this soup and still have plenty to eat. I like to freeze soups and sauces in reusable Chinese food soup containers. I hoard them whenever we order Chinese food because they are very sturdy and don’t crack when you freeze them. Plus, I’m reusing them and keeping them out of the landfill, so I feel good about that. In my recipe I use chicken stock and chicken consommé, but you can easily make this Vegan/Vegetarian but swapping the chicken stock for vegetable stock and swapping the consommé for ½ cup more of vegetable flakes. In a large pot, sauté onions and garlic in oliveoil. Sprinkle with 1 tsp of salt to soften. Let sauté for 1 minute. Then, add carrots, and celery and let sauté another 2 minutes. Add zucchini, continue to let sauté. Add remaining 1 tsp of salt. Add pepper and dill. Once vegetables become fragrant, add chicken stock, water, consomme and vegetable flakes. Bring to a boil. Once boiling, reduce heat to simmer for 45-60 minutes. Aren’t we all California Dreamin’? You guys, I am dreaming not just of California, but of Aruba, Florida, Hawaii and any place where long johns are not involved in dressing for the day. It’s so cold here in NY and we have had just about enough of the constant snow fall and shoveling. The good news is, “Summer bodies are made in the winter.” That was the theme for my latest newsletter which you can read here. If you’re not signed up for my newsletter – now is the time! I’m very close to giving out 3 free recipes from my new cookbook to the subscribers of the newsletter (and no one else)! Don’t miss out. Click here to subscribe. 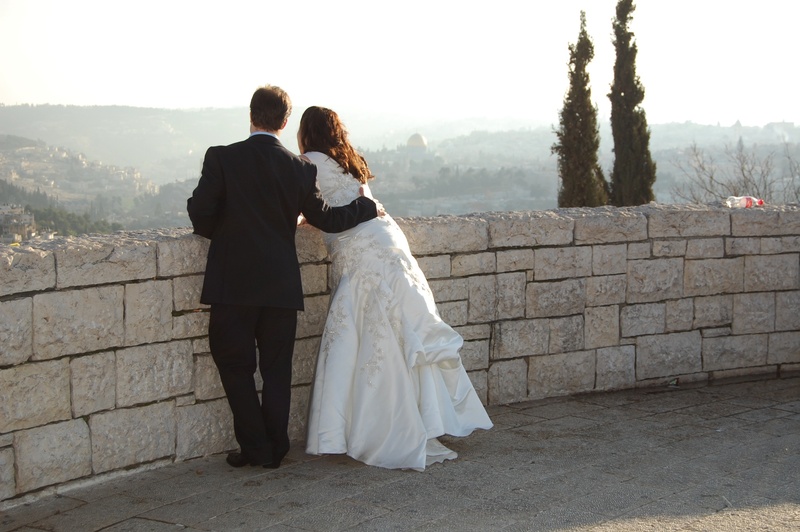 Here’s a quick pictorial preview – enjoy! Read my latest newsletter here. Still working on The Family Plate cookbook coming out this spring! If you want to get 3 free recipes before the book launches you gotta be on the list! Click here! 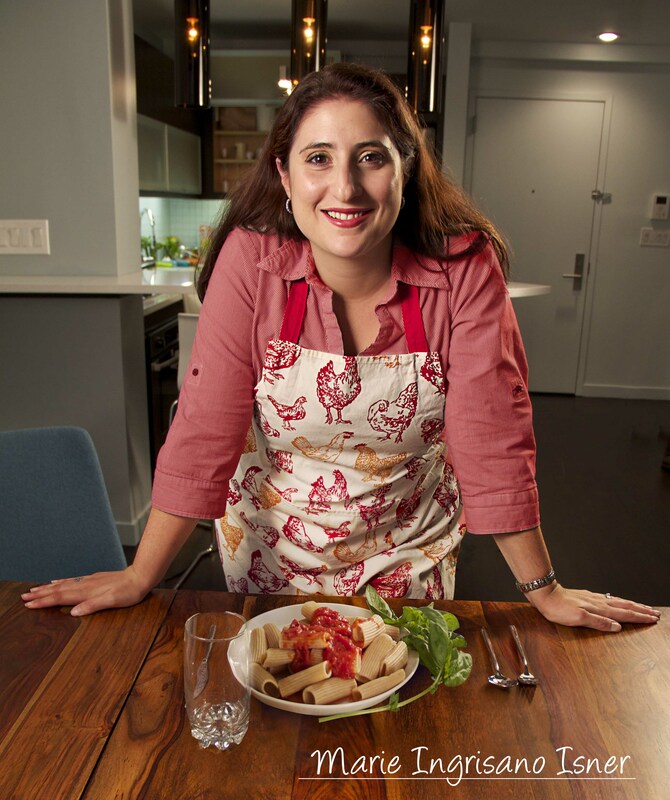 Thank you for the support, I can’t wait to share the recipes with you! We’ve all heard that kale has many virtues. I am constantly trying to find ways to get it in my diet whether it be through juicing or cooking. Kale has Vitamin K, C & A as well as calcium and potassium. It has 10x more Vitamin C than spinach! The benefits of eating kale include weight loss, lowers cholesterol reduces the risk of heart disease and cancer. No brainer, right? Unfortunately, kale can sometimes be a pain to prepare for cooking. You have to remove the ribs from the kale and it can be very tough when you cook it. Once I found the frozen kale in the freezer section I knew it would be easy to create a soup around it! Frozen vegetables are just as good as fresh –sometimes better- and last much longer. 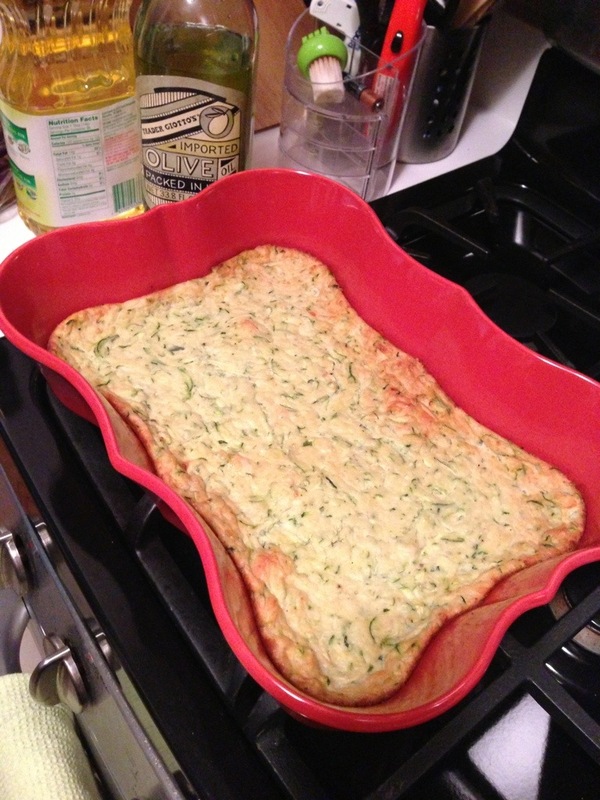 I always keep a variety of frozen veggies on hand so I can whip up side dishes on a busy weeknight. Click here for the recipe! Are you a chocolate lover? I am! I mean, is there any more perfect food out there? Sweet, loaded with antioxidants and a little decadent. Lately, I’ve been enjoying a square of dark chocolate a few nights a week as a little evening snack. I also like to make smoothies and vegan chocolate pudding with Raw Cacoa powder that I got from Longevity Warehouse. 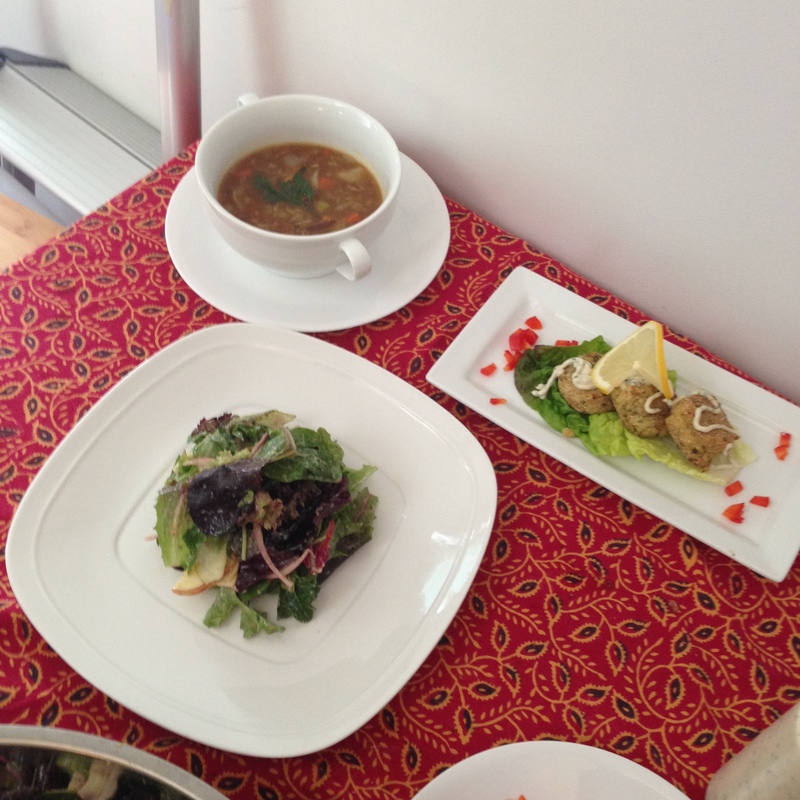 While studying for my Health Coach certification, I learned of the raw foodist David Wolfe. His passion for food and chocolate, specifically cacao, is truly infectious. If you’ve ever been up at 2am watching the Nutribullet infomercial, you have already met David Wolfe as he is the spokesperson. He’s definitely a less “hippy” version of himself in the infomercial, with his trademark long curls seriously cut down, but his passion is still there. I decided this week to revisit my lectures from David Wolfe out of sheer curiosity. I remember watching them back in February and it making a big impact on the way I thought about food. He spends about 45 minutes just talking about making a smoothie! (Though, in my lecture he DOES NOT use a Nutribullet!). After watching these lectures I ordered from raw honey, goji berries and raw cacao powder. It was my “intro to superfoods.” Since then I’ve learned you can find raw honey at almost any corner store in Brooklyn and that goji berries are great for smoothies and snacking. I still have the cacao powder and use it for smoothies and desserts from time to time. All in all, a good purchase. In the lecture David says he’s been a raw foodist for 15+ years and he asks the audience, “Can you believe I’m still alive?” Um, no, I can’t. We’ve been made to think for so long that you need meat and dairy to survive (protein and calcium) and the more I learn about nutrition, it’s just not true. I’ve mentioned many times on this blog that I still enjoy meat and dairy, though in much smaller portions. Having said that, I do eat more vegetarian and vegan sources of protein and calcium than ever before. And I like it! I feel much leaner. I don’t have any digestive issues and I’m finally starting to actually crave the veggies over the other stuff! The thing with raw food (for me) is that in the winter, I’m just too cold to want to eat salads all day long. I crave a hot soup or a Buddha Bowl loaded with veggies. I want cooked food. Cooked food is what makes up the intelligent race of humans we are today. In Michael Pollan’s “Cooked”, he explains that once we learned to cook our food it enables our brains to grow making us smarter than the rest of the species on the planet. We owe a lot to cooked food. And hell, I love to cook! So the idea of raw food 24/7 is not really in my “life plan.” But here’s the message that David Wolfe stuck in my mind back in February, “It’s about adding in the good and all the joy that goes with it.” He’s not saying (and neither am I) that you can never have pizza or eggplant parmigiana again. He’s just saying add in the good. Add in more veggies. Add in more salads. Add in more raw foods and see how your body feels. 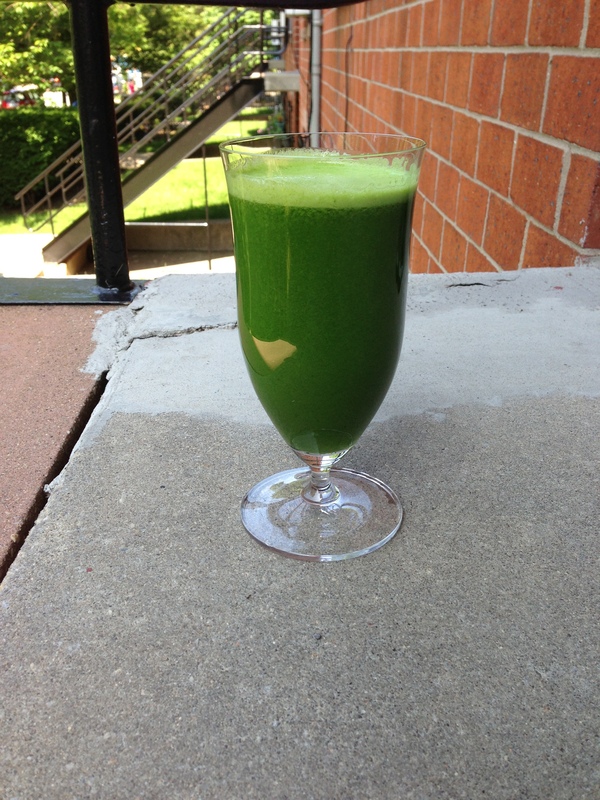 I know for me, my green juice every morning is one of my ways of adding in more raw foods. I also lightly steam my broccoli and green beans so that they retain their nutritional value so they are closer to the raw state (but, raw broccoli, ewe). It’s all about recognizing your own “bio-individuality” and knowing what is right for YOUR body. Especially at this time of year when we are faced with so many stresses and challenges the idea of just adding in joy seems just about right. As you start to think about January and making some resolutions what if you just made resolutions that were about adding in the good instead of weeding out the bad? What would that list look like? Would it be the kind of list that you could actually stick to beyond February? Would it be a kinder way to take care of yourself rather than bullying yourself with starvation and deprivation? Just add in the good. Start now. Decide now to start loving yourself and taking care. I am. On Christmas eve I am enjoying and eating that delicious plate of antipasto and I’m not going to feel guilty because I take care of myself every single day. And as any health coach will tell you, we strive for 90% perfection so there’s a little room for antipasto (or pizza or whatever your craving is). If you’re ready to start blending up a superfood smoothie, check this out. It’s how I started once I tuned into to superfoods and David Wolfe. Enjoy! I bought faro. Now what do I do? I love the Trader Joe’s line of 10 minute whole grains. I’ve already tried bulgur and made some tabbouleh, but this was my first time with faro. It’s more hearty than brown rice in my opinion and held up really nicely in this impromptu salad I put together. This is your basic, “what do I have in the fridge?” kind of recipe I love. I added steamed broccoli and sun-dried tomatoes and had this for lunch today. It was really delightful and filling. I suspect I could eat faro in place of pasta in many dishes and not even miss pasta! I call this salad, “Italian” because it’s the colors of the Italian flag! Plus sun-dried tomatoes are definitely Italian food in my book. Enjoy! Cook time: Follow directions on package of faro. 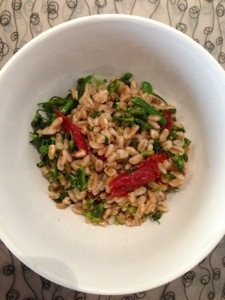 Cool farro according to package instructions. Set aside. Steam broccoli, then chop into bite sized pieces and combine with faro and extra virgin olive oil. Chop sun dried tomatoes and add to faro mixture and stir to combine. Add 1 tsp salt and pepper to taste. Mix well. Serve room temperature or warm. 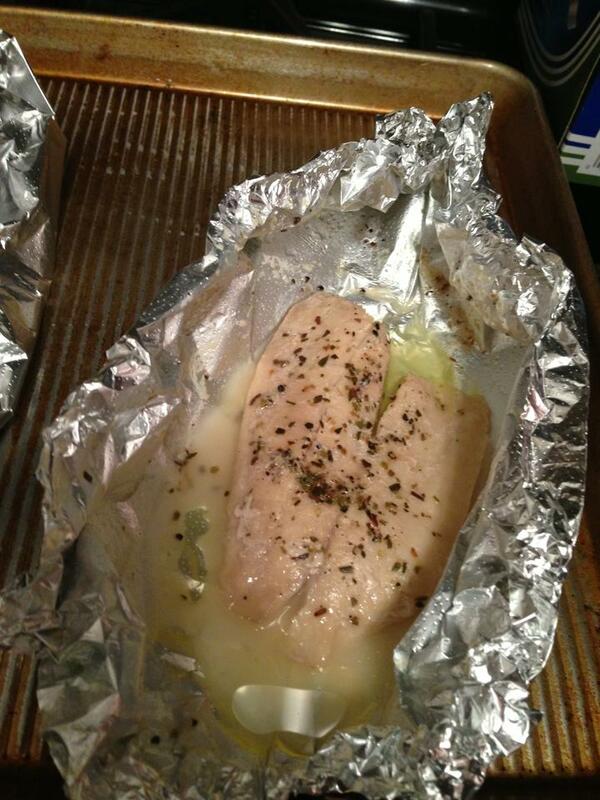 Want to incorporate more fish into your diet but not sure how to prepare it? 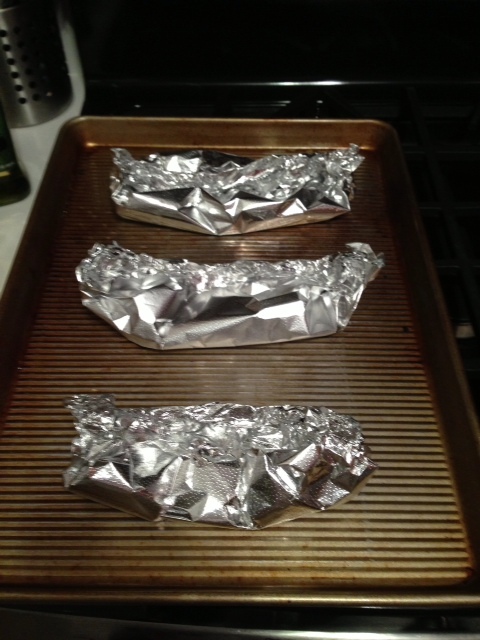 Fold foil into a pocket so no air escapes. Bake in the oven at 350 degrees for 25 minutes. Fish is done when it is firm to the touch and opaque in the center. Works great for tilapia or salmon! Or really any fish you like. Well, summer’s over. So long Summer ’13. Hell,o Fall. It’s still a tough transition, even after being out of school for *gasp* 10 years! I always say, when all else fails, cook something! A homemade dish on the stove top brings me so much joy to prepare and to eat. I love knowing I can find ingredients in the kitchen and whip something up that’s healthy and delicious for my family. It’s so much more satisfying than ordering from Seamlessweb or dialing up Chinese food. Because I made it, I know what’s in it (and what’s not in it – added sugar, fat and salt) and I love to try new things in the kitchen, to find new combinations of delicious ingredients. It’s like the first time I tried mustard on a tuna fish salad sandwich – my whole world was turned upside down! How are these ingredients such a delight together? I never would have known! Well since its officially September, I think it’s “Time to make the chili”! I usually refrain from chili during the summer, although it is a favorite of my 2 year old. Chili just conjures up thoughts of cold nights usually for me. But when I think about the ingredients (turkey chili, salsa, and black beans) they seem light enough for warmer weather, especially now that it is September. Though today it was so hot, that I was longing for the fall weather we had at the end of July. Where is the crisp fall air? because this humidity is killing me and giving me a ‘fro simultaneously. Not pretty. 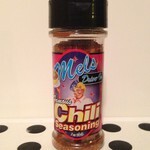 For this impromptu chili, I’m using this chili seasoning that my dad bought me. I’ve never used it before, but it smells great while its cooking on the stove! I also added a secret ingredient to this batch of chili- red wine! Just a few splashes while the turkey was cooking and it gave it a really nice complexity of flavor. Even boring old chili can take on a new life with the addition of a new ingredient. One of my issues with making turkey chili in the past is that you sacrifice flavor for the lower fat content. 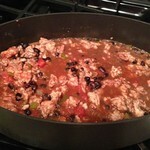 I think the red wine gave this turkey chili back it’s flavor! This is one my husband will like for sure. I’m serving it on top of brown rice and with a salad on the side. Looking forward to digging in tonight! What is the difference between smoothies and juicing? Happy Labor Day weekend! It’s hard to believe that summer is coming to an end. It was a wonderful summer filled with trips out of town, days at the beach and for me, finally breaking through my personal weight loss plateau! Woohoo! One thing I love to do in the warm weather is cool off with smoothies AND juices rather than going for ice cream or milkshakes! I love to start the day this way. Some of my clients were asking me recently what the differences were between blending smoothies and juicing. It also happens, that I’ve been invited to join the staff of OhioOutside.com as a health and nutrition contributor. So I thought that my first article should tackle the subject of Juices vs. Smoothies head-on. OhioOutside.com describes themselves as having a “passion to connect people to all things endurance sport and fitness related.” Of course those running races and cycling need great nutrition and health information so they can achieve their fitness goals – that’s where I come in! I’ll be doing monthly articles on various topics from a health and nutrition point of view. For September I’m writing on article on simple steps to healthier eating, which we could all use after the excesses of summer, amiright? I’ve recently rediscovered how wonderful an egg can be! Eggs are a complete protein and are a very affordable source of protein. Plus, chickens can lay eggs and still live long healthy lives. We have chickens living in the Urban Meadow down the block from where I live. The chickens are in a coop and are part of the garden’s landscape. It makes us feel like we have a little piece of farm life right here in Brooklyn! The chickens spend their days laying a few eggs, getting to see loads of happy families and children and enjoying a lovely life! So, if animal cruelty is on your mind, you can eat eggs without worry. Now, the caveat to that is, that it’s really best to aim for Organic eggs, because those chickens are raised humanely. Organic eggs are the gold standard, but eggs labelled “cage-free” are second best. Some brands are organic AND cage-free, but you need to read the packaging carefully. Eggs that aren’t organic or cage-free or usually factory farmed and kept in cages from birth to death. Something to think about. One dozen organic eggs is currently $4.39 on Fresh Direct. That’s only 37 cents per egg! I think almost all of us can afford that. Find me a snack that’s cheaper and tastier – I dare you! Think about taking just 37 cents into the corner store or bodega. What on earth would you get for 37 cents? 1 piece of gum? The easiest and most fool-proof egg is the hard-boiled egg, and the reason I know this is because I formerly had AWFUL luck cooking eggs. When I first started cooking, back in 2001 while living in London, I ruined an entire batch of eggs just trying to make some over-easy. So I had to regroup and start from scratch. Hard-boiling an egg only requires, water, eggs and a saucepan with a cover. If you can boil water for pasta, you can make a hard-boiled egg. Here’s my recipe for the easiest hard-boiled egg. Eat these as a snack with a sprinkle of salt and pepper, or use a few and make an egg salad. Two hard boiled eggs also makes a great breakfast you can take on the go. I usually make these on the weekend and peel them, so they are in the fridge are ready to eat all week long. Now, some clients have asked me about eating the yolks. My preference is to eat the entire egg with the yolk because that makes it a complete protein. If you are trying to cut calories, you can eat only the egg white, but I hate to waste the yolk so I always eat it. Of course, you should use your discretion. If anyone has a great egg salad recipe, please send it along – always looking for new ways to make it! As I mentioned, for Meatless Monday we attempting a new recipe called Shakshuka. I found the recipe on Smitten Kitchen and it was very easy to follow and the results were deliciously amazing! First you make a simple tomato sauce with jalepeno’s for added kick. Cumin and paprika give it a middle eastern flavor. Then you crack 6 organic eggs into the sauce. Cover it and let it poach for 5 minutes. The results are soft boiled eggs (or hard boiled if you let it cook longer) enveloped in a spicy tomato sauce. We ate it with salad and some warm pita. It would so satisfying as a meal, and there was plenty of tomato sauce left over. The next night, we put the tomato sauce back on the stop top. 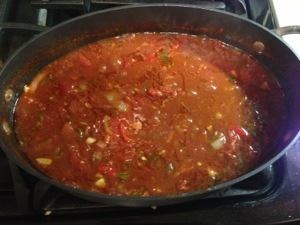 I added one small can of tomato sauce and some water and let it simmer. Then added 6 eggs and made another fabulous dinner out of it. In the future, I would probably only make 4 eggs because 2 for each of us is plenty. Then I would save the sauce, as I did, and make it again with fresh eggs another time. I have a feeling you can’t really reheat the eggs once they are cooked. My favorite part of Meatless Monday is all the new recipes we are trying. It’s become a fun project for my husband and I to tackle together every week. Plus, trying 1 new recipe a week is just about all I can handle as I juggle health coaching, school, work and being with my son and husband. Anything more than that and I might go a little nuts! Next Monday we will just be returning home from a weekend out of town, so I’m not sure if I’ll be able to try a new recipe. But, having this one in my rotation will be great especially because it uses ingredients I normally keep in the pantry and it is so easy to make. Hello! It’s Sunday night so that must mean it’s time for me to rack my brain for a Meatless Monday dinner for the family. 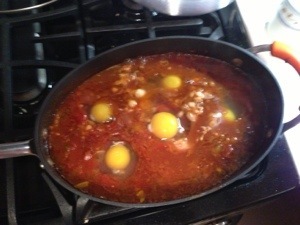 While my husband and I were brainstorming ideas, we both came up with Shakshuka at the same time. 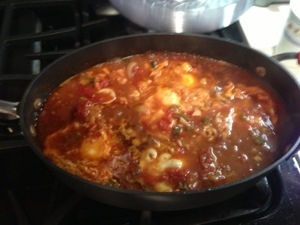 It’s an Israeli dish that is make with eggs in a spicy tomato sauce. I’ve never made it before and have only had it out to eat at places like Mimi’s Hummus here in Brooklyn. It’s a wonderful dish because it had tons of flavor and can be made with no meat added. 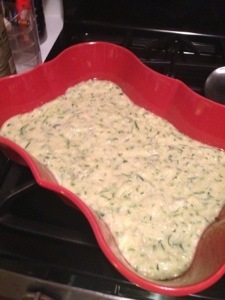 The recipe I’m going to attempt tomorrow night is from Smitten Kitchen. I’ve never made any of their recipes, but I have heard good things. Plus the recipe seems easy enough to follow. Fingers crossed! I’ll probably serve the shakshuka with a green salad and a cucumber salad because I recently acquired some farm fresh cucumbers! Pita bread is also a customary compliment to shakshuka. If this recipe goes well, I look forward to serving it again at my next brunch! So far, Meatless Monday has become a great family project for us to tackle. We are really enjoying finding new and exciting recipes to make and enjoy. It’s fun for us to do together and it really does start the week off on a good foot. We’ve also started eating meat only 1x per day. I’ve been doing this for a while, but my husband recently got on board. My main reason for choosing to eat vegetarian most of the day is because I really need to make sure that I get enough veggies in my diet. So less meat, means more creativity with veggies. I’m also very aware of the fact that meat consumption is terrible for the planet right now, so I want to make a small difference by choosing to eat meat less and less. I’m also buying mostly organic meat which is more expensive, so if we eat meat less I can mitigate the cost that way. I’d really love to beef (haha) up the section of my recipe repertoire that’s vegetarian, so if you have amazing recipes you like for Meatless Monday, please put them in the comments below! I promise to post pictures of my final product as soon as I can. Wish me luck!